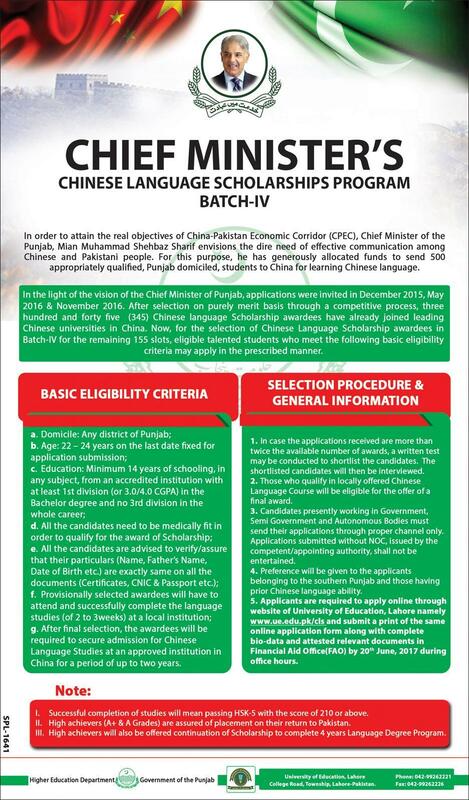 Chief Minister (Punjab) Scheme for Chinese Language Scholarships Phase III announced check required complete eligibility criteria and full selection procedure. To achieve the true objectives of the China-Pakistan Economic Corridor (CPEC), the main minister of the Punjab, Mian Muhammad Shehbaz Sharif, sees the dire need for effective communication between the Chinese and Pakistani people. To this end, it has generously allocated funds to send 500 adequately qualified Chinese, domiciled in Punjab, to China to learn the Chinese language as well. In light of the vision of the Chief Minister of Punjab, applications were invited in December and May 2018. After selection on purely meritorious basis through a competitive process, one hundred and ninety-three (193) Chinese Universities in China. Now, for the selection of the Chinese Language Scholarship holders in Lot IV for the remaining 500 slots, eligible talented students who meet the basic eligibility criteria can apply in the prescribed manner. An average student studying Chinese is expected to take HSK-3 or HSK-4 and most of the universities require HSK-4 with a score of 200 or more to qualify for admission to Bachelor’s Degree Programs in Engineering, Business or Economics etc. At this level, students will be able to have basic everyday conversations. The students who would like to use Chinese professionally are expected to take HSK-5 or HSK-6.Chinese Language Scholarships Eligibility Criteria,Procedure and last date to apply being given as following. Applicants are required to apply online and submit a print of the same online application form along with complete bio-data and attested relevant documents in Financial Aid Office (FAO) by 17th June, 2017 during office hours. Complete Procedure Chinese Language Scholarships to apply could be easily overseen by you as below in very detailed manner as well. Please provide correct information while registration. Registration Information once entered will not be editable except password. Please provide valid email address for registration as it will be used for future correspondence with you. After login, provide personal information, academic detail and work experience (if any) to complete application. Please provide a valid mobile number as this number will be used to contact you in future. After completing online application please review it carefully and submit the application. Once application form is submitted, you will not be able to edit/change any information provided by you. NOC/Departmental Permission in case of government employee.